American Thanksgiving, celebrated on the fourth Thursday in November, is traditionally the first point in the season when we look at the standings and begin to take them seriously. Since the 2005-06 season, 77.3 percent of teams in a playoff spot at American Thanksgiving went on to play postseason hockey, so playing strong hockey to start the year is key for teams looking to be on the ice come springtime. Luckily for the Nashville Predators, they are in excellent position with an NHL-best 33 points thanks to a 16-6-1 record. They have a three-point lead in the Central Division and Western Conference. They rank fifth in the league in goals for, third in goals against,third in save percentage, and tied for 10th in shooting percentage. So as long as they continue on their current trend, they should be considered a favorite to win the division, return to the postseason, and potentially even win the Stanley Cup. So now that it’s passed Thanksgiving and the season is a quarter old, let’s get into some of the details behind the Predators’ great start. So far in 2018-19, the Predators have had two five-game winning streaks while they’ve lost consecutive games just once. Their wins have also come against tough opponents with multiple victories against the Tampa Bay Lightning and New York Islanders, plus lone wins over the Minnesota Wild and Winnipeg Jets. They have scored at least four goals in 13 of their 22 games, tied for the second-most such games in the league. They’ve allowed two or fewer goals in 13, second-most, and have had six games in which they’ve scored at least four goals and allowed two or fewer, again tied for second-most. 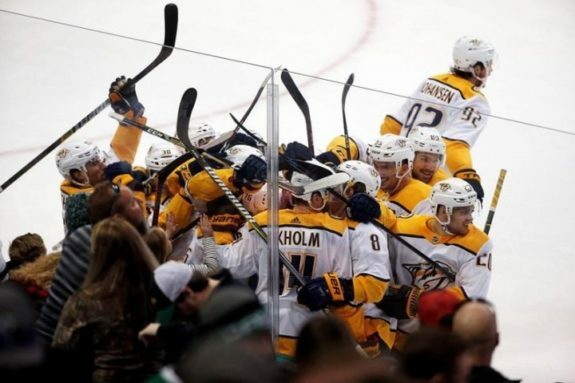 Offensively, the Predators are led by Ryan Johansen with four goals and 21 points in 23 games, Filip Forsberg with 14 goals and 20 points in 23 games, Kyle Turris with five goals and 16 points in 23 games, and Roman Josi with five goals and 15 points in 23 games. In net, they’re once again backstopped by Pekka Rinne, reigning Vezina Trophy winner, with a 9-2-1 record, two shutouts, a .944 save percentage (SV%), and a 1.66 goals against average (GAA). With such a hot start, finding out what has worked to propel them to first in the division, including the players listed above, is important. In 2017-18, when Rinne won his first Vezina Trophy in his age-35 season, it caught a lot of people off guard because it was an outlier compared to his performances in recent seasons. However, being a year older has done nothing but increase his performance as he leads the league in save percentage and goals against average. He also leads the league with 13.91 goals saved above average, and at five-on-five, his .981 low-danger save percentage (LDSV%), .970 medium-danger save percentage (MDSV%), and .867 high-danger save percentage (HDSV%) are better than last year’s numbers. 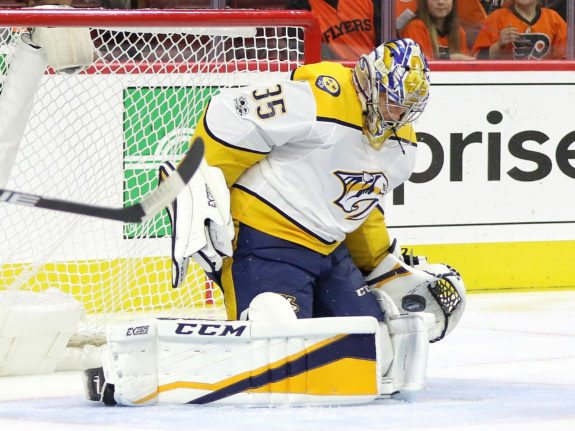 Additionally, when compared to other goaltenders with at least 500 five-on-five minutes this season, Rinne ranks eighth in low-danger save percentage, first in medium-danger save percentage, and fifth in high-danger save percentage. He has allowed two or fewer goals in 11 of his 13 appearances, or 78.6 percent, and is tied for the second-most such games this season. Last season, he had 35 such games in 59 appearances, or 59.3 percent, so he’s already ahead of last year’s pace. Part of the reason for Rinne’s success last season, and this season, is the high percentage of shots the Predators control, partially due to their ability to suppress shots in Peter Laviolette’s system. So far this season, Rinne has faced 40 or more shuts just once, tied with a number of netminders for fewest in the league. Last season, he faced that many shots four times. Nashville’s 62 points from defensemen are most in the league and are on pace to lead the NHL in points by blueliners in back-to-back seasons. Their four defensemen with 10-plus points are also the most in the league and the blue line is responsible for 31.6 percent of the team’s offense. That’s ahead of last season when defensemen represented 29.8 percent of the team’s points. 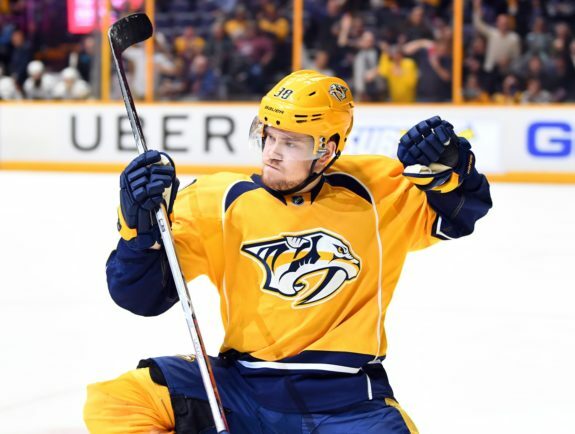 The 2018-19 Predators blue line is led by Josi’s five goals, including one power play goal, and 15 points in 23 games. Behind him is Matthias Ekholm’s three goals and 14 points in 23 games, P.K. Subban’s two goals, one shorthanded, and 12 points in 18 games, and Ryan Ellis’ one goal, a shorthanded tally, and 11 points in 23 games. Nashville’s defensemen have contributed to the team tying for 14th in shots against per-60, ranking ninth in scoring chances against per-60, and tying for 12th in high danger chances against per-60, all at five-on-five. Those ranks are actually lower than I would have expected given the quality of the Predators’ top-four, both as a group and as individuals, as they are giving up more shots and chances at five-on-five than I realized. However, with an elite netminder like Rinne in net who can bail them out, the majority of mistakes made by defensemen are covered up and don’t result in goals. Furthermore, many of the league’s best puck-moving defensemen often have elevated shots against per-60. But they generally also have even higher shots for per-60 and often one of the best defenses is having the puck on one’s stick the majority of the time. Nashville doesn’t have the elite forwards that the Pittsburgh Penguins, Washington Capitals, and Lightning do with Sidney Crosby, Alex Ovechkin, and Nikita Kucherov, respectively. The Predators don’t have any players in the league’s top-10 in goals or points, but that’s because they’re not set up that way. This means they rely on depth scoring across all four lines and from the defense to generate offense, something they are receiving this season as they rank fifth in goals. The team’s 11 players with 10 or more points are tied for most in the league, yet they only have two with at least 20 points, tying them for 12th-most. So while Forsberg and Johansen have played at near point-per-game paces this season, it’s the forwards in the middle-six that have provided unexpected production and drive the offense. One of these players is Craig Smith, who has moved up to the top line in Viktor Arvidsson’s absence. In 23 games this season, Smith has five goals, including one on the man advantage, and 10 points. While those stats are significantly off last season’s pace when he set a career high in goals, his five-on-five rate stats are only slightly down, indicating that the biggest reason for the down tick in production is a regression in power play scoring. However, as his power play shooting percentage is down over 22 percent from last season, he’s unlikely to replicate 2017-18’s totals. Yet, even if his numbers on the man advantage don’t rebound, he can still be plenty productive if he can get his ability to generate offense at five-on-five back to career norms, as they are currently down. Then there’s Calle Jarnkrok, coming off his first career hat trick on Nov. 17 against the Los Angeles Kings. In total, he has six goals and nine points in 20 games this season and is on pace to set career highs in goals and points. He capitalized on his opportunity to play with Turris as his center and is shooting 25 percent, a shooting percentage all but certain to regress moving forward. However, if he continues to produce, he should remain in the top-six and will continue to provide depth scoring. The other winger on Turris’ line in recent games is Ryan Hartman, who, at 24, likely still hasn’t reached his peak and is currently on pace to also set career highs in goals and points. His six goals and 10 points through 23 games is the fastest start of his young career, thanks to a rise in five-on-five rate stats. With a goal in the Predators’ most recent game, again on Turris’ line, Hartman should continue to play in a top-six role. 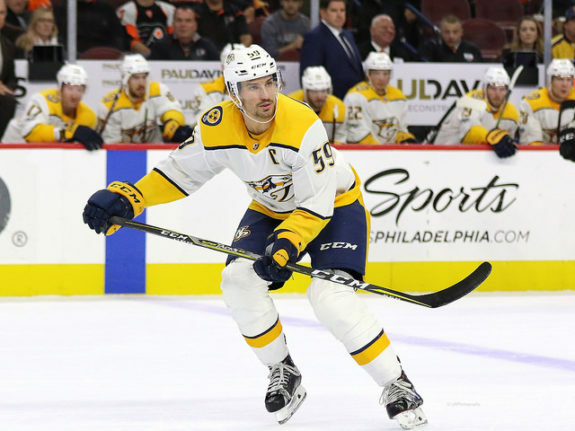 While those aspects have gone right so far, there are several things that have gone wrong or need addressed for the Predators to be an even better team. Currently, Arvidsson and Subban are the only Predators on injured reserve. And while two players isn’t a lot, the fact that both are among the best on the team at each’s respective position, their absences are significant. Subban is out with the ever-vague lower-body injury and has been on injured reserve since Nov. 14 and it’s unknown when he’ll return. 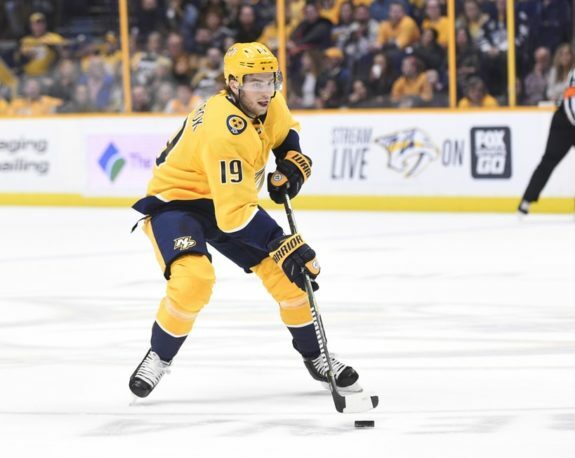 Meanwhile, Arvidsson was placed on injured reserve on Nov. 11 with a broken thumb and is expected to miss six-to-eight weeks, an estimation that goes into 2019. He was injured in a Nov. 10 matchup against the Dallas Stars in his first game back from a previous stint on injured reserve, that time with a lower-body injury that cost him three games. There’s also Turris, who left their Nov. 23 matchup early with injury but there hasn’t been a diagnosis or timeline for recovery. In addition to those three, the Predators had several others miss time earlier this season. Defenseman Dan Hamhuis was placed on injured reserve on Oct. 25 with an undisclosed injury and was activated on Nov. 15. Jarnkrok missed three games between Nov. 10 and 13 with a lower-body injury. Finally, Rinne missed five games after he was placed on injured reserve on Oct. 20 and was activated on Oct. 31. In his absence, Juuse Saros got the start and the team went 2-2-0. Speaking of Saros, the 23-year-old netminder has struggled this season and doesn’t look like the player who set career highs last season in the highest workload of his career. A couple of basic stats: in 2017-18, he made 23 starts, had an 11-5-7 record, three shutouts, a .925 SV%, and a 2.45 GAA. By comparison, in 2018-19 he has made 10 starts, has a 7-4-0 record, one shutout, an .891 SV%, and a 3.29 GAA. At five-on-five, his .948 LDSV%, .884 MDSV%, and .818 HDSV% are all down from last season and he has allowed four-plus goals in five games while he had five such games all last season. His struggles can’t really be blamed on anyone other than himself either, because at five-on-five he faces fewer shots per-60 and high danger chances per-60 than Rinne, yet makes significantly fewer saves. Because he is young and remains Rinne’s successor, the team isn’t going to give up on Saros. This is most likely just a period of struggle for him. But what was supposed to be an area of strength for the team, possessing two starting-quality netminders, has now become questionable. 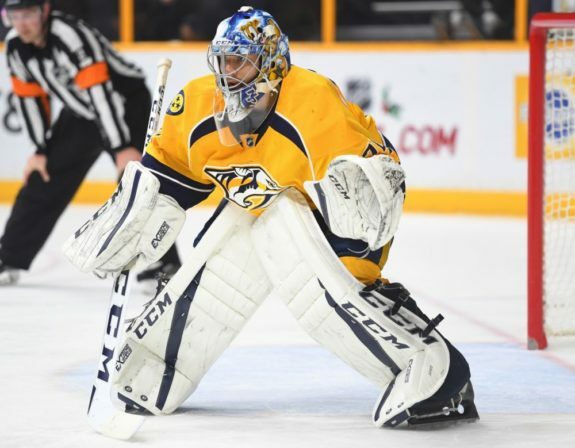 The team also wants him to get back to how he’s performed in the past in order to keep Rinne fresh for the stretch run and postseason. For as good as the Predators’ offense has been, their power play has been abysmal, converting on just 13.8 percent of opportunities, giving them the 29th-best unit in the league. Their 14 goals scored on the man advantage are tied for 22nd while they’ve received the most power play opportunities. They also already have three streaks of at least three games without a power play tally. Eight Predators have netted power play goals with only Forsberg and Turris having multiple, tying them for the fewest players with multiple goals on the man advantage. Furthermore, 12 players have registered power play points and 10 have two or more. As would be expected from a team with a blue line like the Predators, they’ve scored just one power play goal in which a defenseman didn’t earn a point. That’s alright when it works, but in a league that is moving away from having defensemen on the man advantage and work to get the puck down low rather than rely on point shots, their setup doesn’t always work. Heat map for the Predators on the power play. 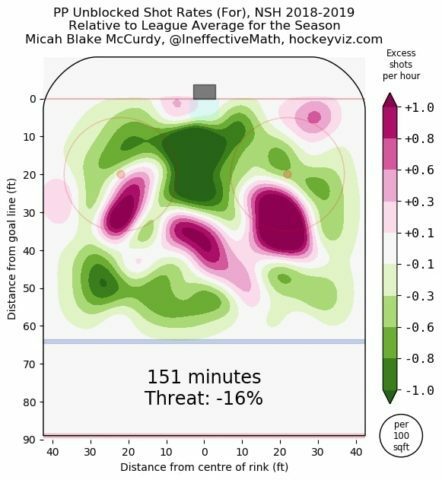 Purple indicates higher concentration of shots, green a lower concentration. Created by Micah Blake McCurdy from hockeyviz.com. This is evident as they are generating the 16th-most shots per-60 on the power play this season. They also rank 21st in scoring chances per-60 and 20th in high danger chances per-60 on the man advantage. Yet, arguably the biggest reason for their power play struggles is that they are shooting 9.02 percent, worst in the league. By comparison, they shot 15 percent last season, when they ranked sixth. On the penalty kill, they’ve performed better as they tie for 14th at 82.2 percent. They also tie for ninth in power play goals allowed and for 17th in number of times shorthanded. They’ve been solid at killing penalties in recent games as they haven’t allowed a power play goal in five games despite taking three or more penalties in three of their past five games. They do, however, have decent rate stats while shorthanded as they are tied for 14th in shots against per-60, rank 14th scoring chances against per-60, and 22nd in high danger chances per-60. Given the injuries they’ve faced, the Predators have played as well, if not better, than could be expected. They have the league’s best defense, are receiving great goaltending from Rinne, and enough offense for the time being. They do need to address their special teams struggles and get Saros back on track, but in general, they have performed well. Additionally, as Arvidsson and Subban return from injured reserve, they should only get better, further strengthening their claim as a Stanley Cup contender. If there’s one area that could be upgraded, it’d be adding another proven scorer to bolster their top-six. With a farm system that has several solid defense prospects, don’t be surprised if GM David Poile addresses this need. 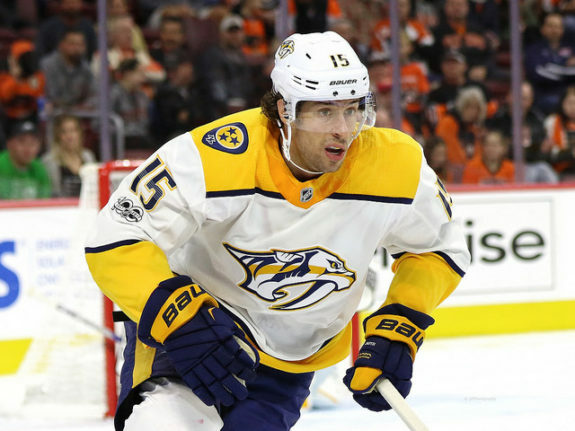 If he is able to do so, it could take the Predators from Stanley Cup contender to favorite.